Ludwig van Beethoven. Very Good. In very good packaging. 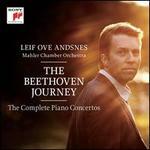 The Beethoven Journey: The Complete Piano Concertos. Very Good. CDs, plastic cases, and slip case are in excellent condition.